Locked In is a revelatory investigation into the root causes of mass incarceration by one of the most exciting scholars in the country. 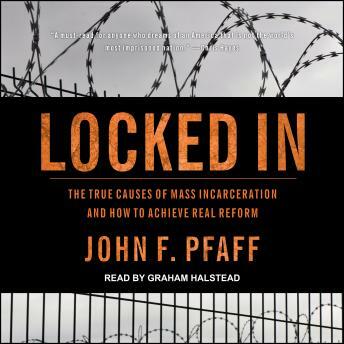 Having spent fifteen years studying the data on imprisonment, John Pfaff takes apart the reigning consensus created by Michelle Alexander and other reformers, revealing that the most widely accepted explanations-the failed War on Drugs, draconian sentencing laws, an increasing reliance on private prisons-tell us much less than we think. Pfaff urges us to look at other factors instead, including a major shift in prosecutor behavior that occurred in the mid-1990s, when prosecutors began bringing felony charges against arrestees about twice as often as they had before. He describes a fractured criminal justice system, in which counties don't pay for the people they send to state prisons, and in which white suburbs set law and order agendas for more-heavily minority cities. And he shows that if we hope to significantly reduce prison populations, we have no choice but to think differently about how to deal with people convicted of violent crimes-and why some people are violent in the first place.